Cleaning Your Bathroom Has Never Been Easier! 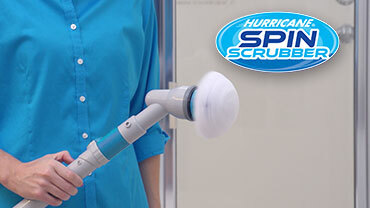 Hurricane Spin Scrubber™ makes it so easy to clean. This powerful scrubber does all the hard work for you! You can use your Spin Scrubber to clean the shower walls. Say goodbye to that nasty grime! OFFER: Get your Hurricane Spin Scrubber with 3 unique scrubber brushes, extension pole, AC adapter, and mesh storage pouch for only $39.99 and receive FREE SHIPPING & HANDLING. But wait - you can double your order and receive a SECOND Hurricane Spin Scrubber and accessories. Just pay a separate fee of $19.99. You Hurricane Spin Scrubber includes a 10-year extended warranty. UPGRADE to the DELUXE Hurricane Spin Scrubber and clean with more power. The Deluxe Hurricane Spin Scrubber has a stylish black housing and features an upgraded motor. Plus, you'll receive a LIFETIME warranty. Just pay $49.98 plus FREE shipping & handling. HURRICANE SPIN SCRUBBER 10-YEAR WARRANTY: Your Hurricane Spin Scrubber has an extended 10-Year Warranty that covers the 10-year lifespan of the product. Should anything happen to your Hurricane Spin Scrubber under normal usage simply return the unit and you will receive your money back, less shipping and handling and/or depreciation. Mistreatment, misuse, and intentional abuse of Hurricane Spin Scrubber is not covered under the 10-Year Guarantee. DELUXE HURRICANE SPIN SCRUBBER LIFETIME WARRANTY: Your Deluxe Hurricane Spin Scrubber has a lifetime warranty that covers the lifetime of the product. Should anything happen to your Deluxe Hurricane Spin Scrubber under normal usage simply return the unit and you will receive your money back, less shipping and handling and/or depreciation. Mistreatment, misuse, and intentional abuse of Hurricane Spin Scrubber is not covered under the lifetime warranty.